Here is, in more detail, how the graphic beta rule acts in the lambda calculus sector of the graphic lambda calculus. It is a graph in , i.e. a trivalent or univalent locally planar graph, with the decorated nodes corresponding to the operations of lambda abstraction, application, FAN-OUT (but, attention, not really a fan-out gate, unless the GLOBAL FAN-OUT move is used), and termination node (corresponding to univalent nodes). Moreover, it has a “mouth”, named in the figure “IN”, which is continued by a tree of FAN-OUT gates (this tree may be trivial, i.e. just an arrow). The green discs represent the insertion points of the FAN-OUT tree into the rest of the graph. After the animal eats, it spills by the OUT arrow. There are no other OUT arrows. Animals have the following nice property: an animal which eats a graph in the lambda calculus sector (i.e. an untyped lambda calculus term) spills out a graph in the lambda calculus sector (a term). You may think about an animal as being a term in untyped lambda calculus, with a variable which is marked (now the green disks correspond to the places where the variable appears in the term). When the animal eats another term , it means that the variable is replaced by in . Otherwise said, an animal is an expression like . Animals are not graphs in the lambda calculus sector. This is another animal, with trivial FAN-OUT tree after the IN arrow. So graphic beta move, as seen acting on the lambda calculus sector, looks like a transformation of animals. Untyped lambda calculus is so complex because animals are complex objects, defined by GLOBAL rules, not because the beta move has any intrinsic complexity inside (here I use the word “complex” in the vague, usual, sense, not in any technical sense). Concerning one article of the Romanian Minister of Education Ecaterina Andronescu, according to the review of integru.org, “6 international experts in the field confirm that the work constitutes plagiarism and falsification of data”. UPDATE: A new review concerning a series of 4 papers just appeared. The Ministry of Education and other, equivalent, organisms are to be held responsible for the damage incurred to the image of many innocent Romanian researchers. A 3-parts system for scientific credibility. in the sense that this new case is again about an OLD DISCRETE and power hungry person (see the analysis for definitions of “OLD” and “DISCRETE”). Here is my (probably very sketchy) understanding of this mysterious “reentry”. Say is the collection of neurons of the brain, a discrete set with large cardinality . At any moment the “state” of the brain is partially described by a matrix of weights: the number is the weight of the connection of the neuron with the neuron (a non-negative real number). We may imagine such a state of the brain as being the trivial groupoid with a weight function defined on arrows with values in . Instead of neurons and weights of connections we may easily imagine more complex situations (for example take the trivial groupoid generated by connections; an arrow between two connections is the neuron incident to both connections, and so on; moreover, weights could be enriched,…), so let’s just say that a state of the brain is a weighted groupoid. With a dynamics of weights. Define a “neuronal group” as being a sub-groupoid with a weight function. Take now two neuronal groups and . How similar are they, in the brain? For this we need a cost function which applies to any “weighted relation” (in the brain, i.e. in the big weighted groupoid) from to and spills a non-negative number. The similarity between two neural groups (with respect to a particular state of the brain) is the minimum of these numbers over all the possible connectomes between and . My feeble understanding of this reentry is that, as time passes, the state of the brain evolves in a way which increases (in fact decreases the cost of) similarity of neuronal groups “encoding” aspects of the same “stimulus” which are correlated in time. We may the imagine a “large scale homunculus” as being a similar but strict neural sub-group of the whole brain. The reentry weighted relation will then have a structure of an emergent algebra. Indeed, there is a striking similarity between this formalization (probably very naive w.r.t. the complexity of the problem, and also totally ignoring dynamical aspects) and the characterization of emergent algebras as being related to the problem of exploring space and matching collections of maps, as described in “Maps of metric spaces“, see also these slides. I shall come back to this with all details later. Gold Open Access: enter the mouth! – Carl, I dunno, there are these sneaky rats everywhere, they seem to enjoy this post apocalyptic world of ours. They are good food, but they are so small and they move so fast, totally un-dinosaurish like. But I’m hungry, Carl, I’d love to chew some, now that the big preys seem to be gone. What to do? – Let’s convince them that it’s totally cool to enter in our mouth by their own will. That way, we could stay still, with our mouths wide open and they are going to come to us and we are going to wink at them, telling them “that’s right, look, you’re totally dinosaur material, sonny, come on, enter the mouth, that’s the goal, yes, it has always been like this and it will be like this till the end of times”. – That’s a golden idea, Carl, golden! The dinosaur named Carl appeared first time in “The Purposeful Life” by Abstruse Goose. UPDATE: The problem of connecting two gates, as explained in this post, is equivalent with the oriented Reidemeister move R2c, itself equivalent with R3a, for the untyped lambda calculus crossing macro. Therefore we cannot, in graphic lambda calculus, without the dual of the graphic beta move, at least, solve the problem of gate connections. 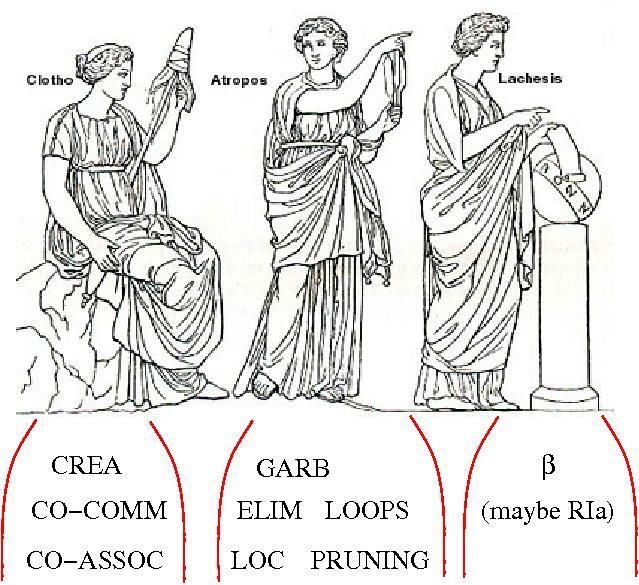 In the post “Ancient Turing machines (I): the three Moirai” I explained how Clotho, Atropos and Lachesis may build together a Lisp-like based Turing machine, in terms of the graphic lambda calculus. There is something missing, though, namely how to connect gates, once created. I shall explain this further. After that I shall finish with a reminder of the real goal of these posts, essentially mentioned in my comment of the last post. Recall that the three Moirai know how to create the lambda abstraction gate, the application gate, the FAN-OUT gate and the termination gate, now the question is how they connect two gates, once they have them. In the next figure is given a solution for this. So, the problem is this: we have two threads, marked 1-2 and 3-4, we want to obtain a thread from 1 to 4. For this we add a loop and Lachesis performs a graphic beta move (alternatively, without adding a loop, Lachesis does a R1a move). 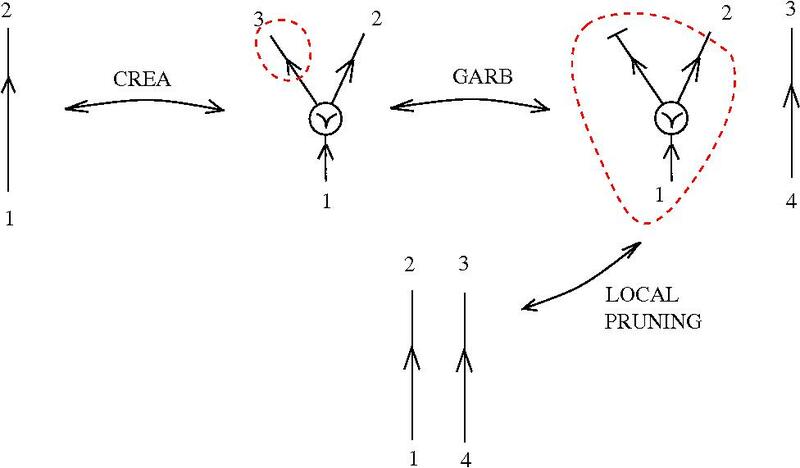 Lachesis continues by doing a second graphic beta move, as indicated in the figure. Finally, she performs a number of beta moves equivalent with the oriented Reidemeister move R2c (see the mentioned Polyak’s paper for notation). I have not counted how many moves are needed for R2c , but the number can be inferred from the generation of the move R2c from the moves R1a, R1b, R2a, R3a. Now the construction is finished, let us leave the Moirai to do their job. Finally, I shall recall my real goal, which I have never forgot. The real goal is to pass from understanding of the power of this lambda calculus sector of graphic lambda calculus to the real deal, called “computing with space”, namely to understand space from a computational perspective, not as a given receptacle, but as a small list of procedures along with some impossible to verify assertions (like that we may rescale indefinitely space), see “emergent algebras”, which can always be eliminated a posteriori, by a kind of finitization procedure. This is a first post about interpreting the Turing machine in ancient terms (I have at least another interpretation in mind, which I shall explain later). It’s your choice to interpret it as a tongue-in-cheek or verbatim. Here are the facts. Go to the tutorial “Introduction to graphic lambda calculus” if you want to understand the graphic conventions and the moves. Clotho ( /ˈkloʊθoʊ/, Greek Κλωθώ [klɔːˈtʰɔː] – “spinner”) spun the thread of life from her distaff onto her spindle. Her Roman equivalent was Nona, (the ‘Ninth’), who was originally a goddess called upon in the ninth month of pregnancy. Lachesis ( /ˈlækɨsɪs/, Greek Λάχεσις [ˈlakʰesis] – “allotter” or drawer of lots) measured the thread of life allotted to each person with her measuring rod. Her Roman equivalent was Decima (the ‘Tenth’). Atropos ( /ˈætrəpɒs/, Greek Ἄτροπος [ˈatropos] – “inexorable” or “inevitable”, literally “unturning”, sometimes called Aisa) was the cutter of the thread of life. She chose the manner of each person’s death; and when their time was come, she cut their life-thread with “her abhorred shears”. Her Roman equivalent was Morta (‘Death’). 2. Let’s interpret their activity as something equivalent to a Turing machine. I shall use untyped lambda calculus, which has the same computational power as Turing machines. Better, I choose to work with graphic lambda calculus (tag archive , first paper), which has a sector equivalent with untyped lambda calculus. The challenge is to arrive to generate all graphs in by using the three Moirai, specifically by formalizing their activity in terms of graphic lambda. The following figure contains this, let’s contemplate it and then pass to explanations. Basically she introduces a FAN-OUT gate into the thread. 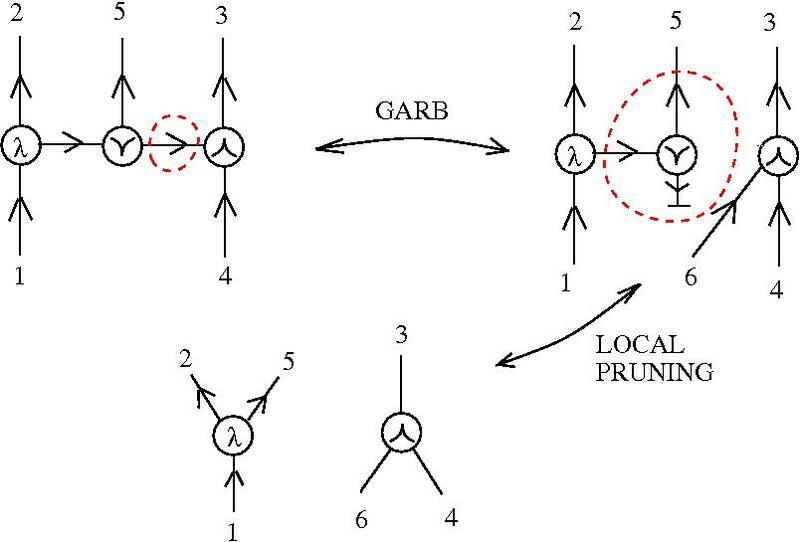 In order to make this gate to function as FAN-OUT, she also needs from the graphic lambda calculus the moves CO-COMM (which allows her to permute the outputs) and CO-ASSOC (which allows her to not care about the order of application of a cascade of FAN_OUT gates). She picks from the moves of graphic lambda calculus LOCAL PRUNING and ELIMINATION OF LOOPS, which are kind of her style. This is a graphic form of reduction, so you may say that LACHESIS is performing something akin to reduction. 3. How does it work? The Moirai have a thread to start from. Their first goal is to produce the gates. They can easily have two gates, one appearing after GARB, the other appearing after CREA. They still need the application gate (corresponding to the application operation in lambda calculus) and the lambda abstraction gate. They also need to have enough threads to play with. Here are two ways of getting them. The first one is using only GARB and CREA moves. The dashed green curves represent the input and the output of their activities. The dashed red curves indicate where the moves are applied. Then LACHESIS may use her graphic beta move in order to get a thread and a loop. ATROPOS has to refrain to use her ELIMINATION OF LOOPS for later! Now the three Moirai are ready to produce the application and lambda abstraction gates. CLOTHO and LACHESIS start with two threads (which they already have), in order to get to an intermediary step. From here, with some help from ATROPOS, they get a lambda gate and an application gate. From here the Moirai have to be very clever and patient in order to construct the graphs which correspond to the lambda calculus terms needed for something equivalent of a Turing machine. They have to be clever because they want to construct graphs in from the lambda calculus sector, and for this they have to cleverly use loops in order to satisfy, at the end, the global conditions which graphs from the lambda calculus sector satisfy (that is, basically, the condition that whatever exits from the right hand side exit of a lambda gate, has to either end in garbage, or to continue until it enters by the input of the said lambda gate). Their work could be made easier if they learn a bit of LISP and they follow the indications of this paper. 1. Could it be that the Moirai take some shorcuts through the maze of constructing a Turing machine and instead, thread our fates in an equivalent (or more general?) way, but using less sophisticated building blocks? 2. As they spun the destiny of the Universe, they do it in a computable fashion? For a very nice and truthful depiction of the process of (scientific?) discoveries I recommend the article “The colossal pile of jibberish behind discovery, and it’s implications for science funding” by Mark Changizi [title copied as appeared in Discover Magazine]. I shall give some excerpts and then I shall add some comments of my own. …how we scientists find our ideas is ugly, and frankly embarrassing to show folks. That’s why we don’t put this part of the process into our journal articles or books. Now, the photographs don’t possess enough resolution to read much from them. My intent here is to indicate just how much of the sort of notes and brainstorming goes on. And it also shields me from the humiliation of you reading hundreds of pages of my disorganized senselessness. Everybody has loads of notebooks, right? Or maybe not, instead lots of files with half written ideas, always in the process of being rewritten and finally abandoned after canibalizing some useful bits? I remember that the most worthy part of my first notebook (when I was 10) was about how magnets work. I was fascinated by them (as well as by mirrors). I was trying to understand how a magnet attracts or repels another without touching it. A magnet is basically just a piece of rock, it sits there doing nothing until another magnet (or a piece of iron) comes close and then, by magic, it moves. Not only that a magnet comes into motion only when another magnet is close, but it’s capacity to move never consumes, not even after ages pass by (arrived to this conclusion after repeating the experiment for two weeks). If I drop a rock on the ground I have have to lift it up again in order to make it move (by letting it fall). But a magnet never loose it’s energy. And then, the night after after a biology class I had an epiphany. You see, think about the magnet as being a heart. 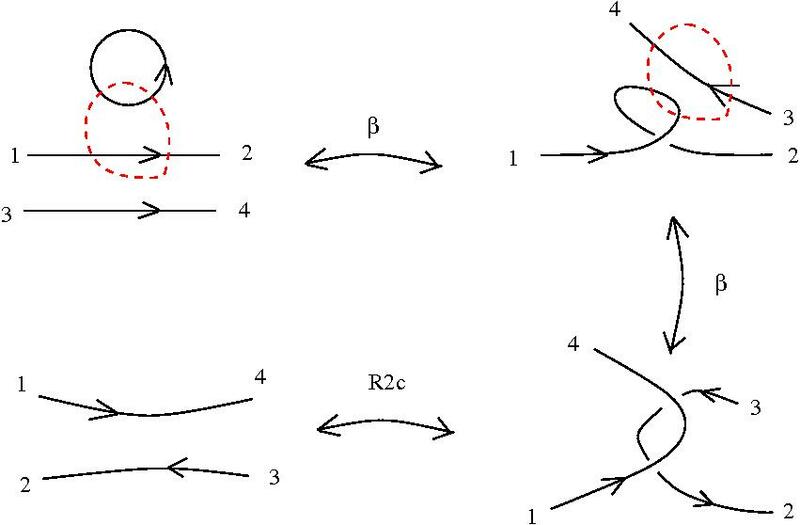 When interacting with another magnet, by a systole it sends it’s energy to the other magnet, then it relax, having a diastole and the energy comes back, closing a cicle. It has to be this! – it improves the style of presentation, it gives courage to express one’s personal viewpoint in a more sincere way, thus creating variety where there is very little. Without this variety how to discern among two scientists, one which systematically explores a tiny patch and writes a hundred papers on the same inequality in functional analysis (say, random subject! ), exhausting the subject like a vacuum cleaner, and the other who opens new directions of exploration, without going to the last detail, but giving enough clues so that the idea has a future. Both types of researchers are needed, but the first type is overrepresented, because of the modern risk aversion policies in science. Due to the easiness of sharing, which is a feature of present day communication trough the net, this is, moreover, feasible.